The mattress that provides absolute support to the spine and back muscles. The core of the mattress is profiled to match the shape of the human spine. This special shape is able to adapt to the individual proportions of the body. 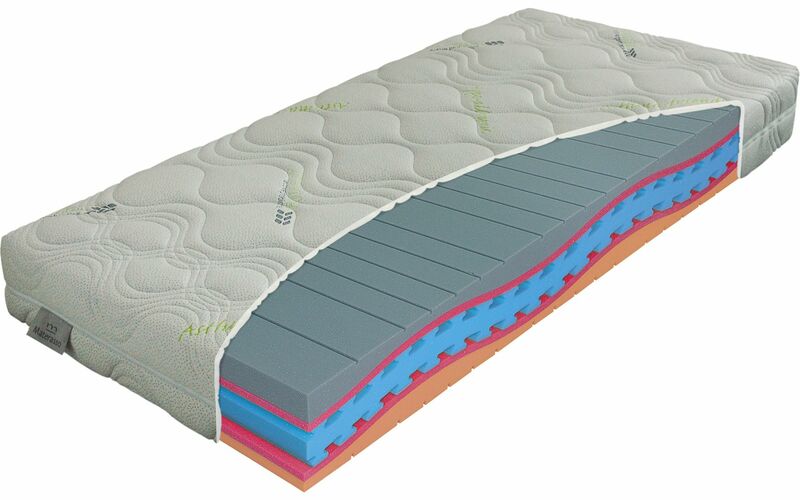 A bearing mid layer of quality SANITIZED foam guarantees the right level of firmness and the antibacterial properties of the mattress, which has a different level of firmness on each side. Springy NIGHTFLY foam is used on the top side, ensuring a high level of comfort and long lifespan. The firmer underside and the core of the mattress are made of Eliocell foam, which excels at holding and supporting the spine. The centre of the mattress, meanwhile, contains an anatomically profiled and ventilated core. The Greentex cover, with its natural probiotics, rids the fabric of allergens, suppresses moisture and in doing so prevents the production of moulds. It also removes odours and harmful micro-organisms. The cover satisfies all requirements made of a hygienic and anti-allergic cover and is also treated to repel mites.